Smithtown officials say rebuilding the Daniel J. Flynn Memorial Park will help bring back softball tournaments. Smithtown Councilman Thomas Lohmann and parks Director Joe Arico show a rendering of a rebuilt Flynn Memorial Park. 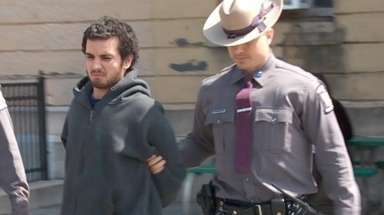 Photo Credit: Newsday/J. 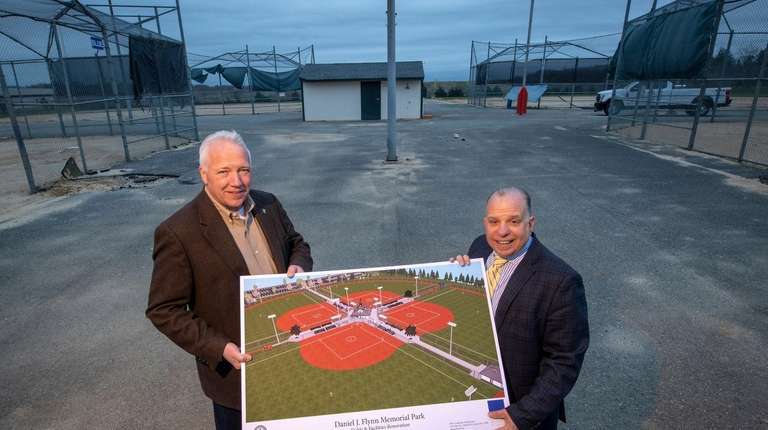 Conrad Williams Jr.
Smithtown is moving ahead with a $4 million plan to rebuild Daniel J. Flynn Memorial Park with hopes of turning the softball complex off Commack's Old Commack Road into a destination for the region’s top teams by fall 2020. 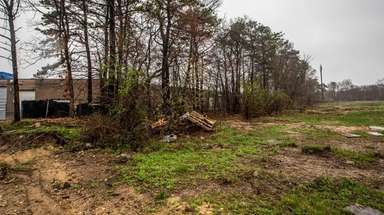 The plan that staffers and consultants presented to the town board this month calls for the park’s four fields to be regraded and resurfaced with natural or artificial turf, a new drainage system underneath to allow for play to resume rapidly after rain, warning tracks and pitchers’ warm-up mounds. 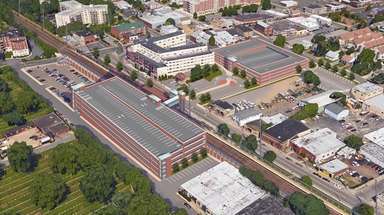 Two fields will be ready for play by 2020, and all four by 2021, officials said. Also planned are LED field lighting and a two-story hub building with ground-level concessions, bathrooms, a pro shop and an air-conditioned second-floor office for officials. Fans will get covered bleachers, and new fences extended from field backstops will protect anyone walking along the baselines. A playground formerly located on the park’s edge has been demolished and will be relocated to a more central location. The bond-funded rebuild will the park's first since its 1979 dedication. “We’re going to be bringing back softball tournaments,” Councilman Thomas Lohmann said. “We’re bringing back law enforcement world tournaments, Wounded Warriors” and Little League, he said. Weekend tournaments — which can attract dozens of teams, each with at least 10 players, sometimes family members and fans as well — typically bring thousands of dollars in fees, town and softball league officials said, but can have a bigger effect on local businesses. 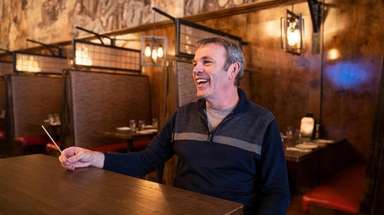 “Your delis, your 7-Elevens, the hotels in the area — the economic boost we’ll see from this will be beneficial to the community as well,” Lohmann said. Smithtown hosted tournaments, including regional championships, during the 1980s for the organization now known as the United States Specialty Sports Association, which sanctions most of the softball leagues on Long Island. The town was home to Rick Marz, who oversaw USSSA's Long Island work for decades, along with roughly about a dozen players, officials and teams now in the USSSA New York Hall of Fame. But the tournaments became less frequent as facilities declined. Games were canceled because of puddles in the infield. Outfielders played on a slope. Asphalt paths cracked. Bigger events have sprung up elsewhere. Gary Godden, executive state director for the USSSA, said some of the group's biggest tournaments are now held in Florida. Year-round play pumps tens of millions of dollars into that state’s economy, he said. Softball participation overall is down from the '70s and '80s, when many companies fielded teams, sometimes hiring ringers who were paid more for their play than for their output on the shop floor, he said. Grumman alone once had 40 softball teams. Long Island nevertheless remains a promising market, with about 1,000 softball teams, he said, and Smithtown’s planned improvements would set its facility apart from others. Vinny Simeone, USSSA Long Island director, said Suffolk County has just a handful of the four-field complexes that are most desirable for tournament play and that not all are lit for night play. Nassau County’s Mitchel Park has a four-field complex, but lacks the fences needed for sanctioned tournaments, he said.